Amazing 1970 Chevelle SS 454 Survivor! 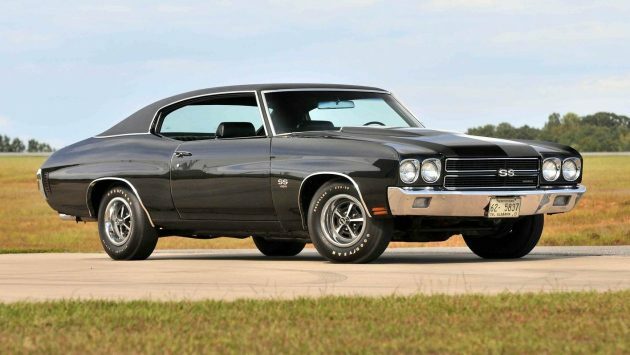 This beautiful triple black Chevelle is not only a highly desirable SS 454 LS6 model, but it’s also claimed to be an unrestored survivor with only 33k miles on the odometer! This really could be the ultimate muscle car! It’s going to cost the next owner though, no doubt about that. It’s crossing the block sometime this weekend at the Mecum auction in Harrisburg, Pennsylvania. 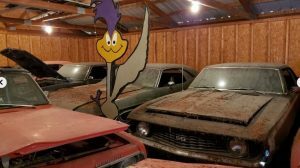 Do you think muscle car values are going to keep climbing or is this bubble about ready to burst again? The only way this car could be better would be if it had a rock crusher 4-speed. Oh, who am I fooling! There’s so much power on tap that most of us would be better off with the automatic anyway. 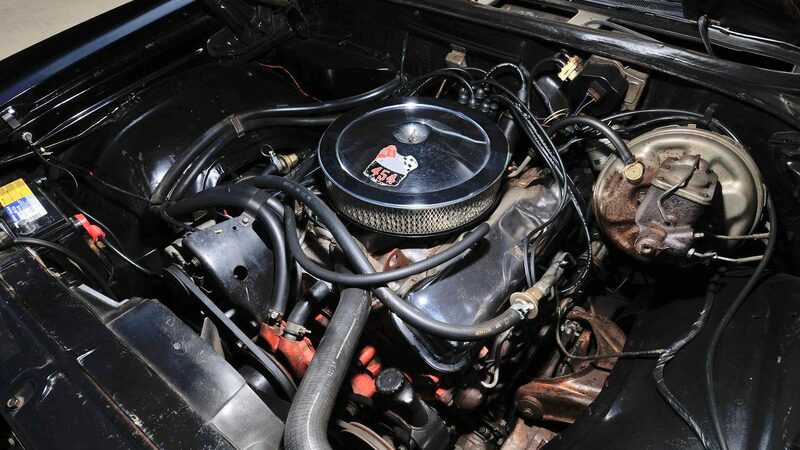 The LS6 option added a beefier bottom end to the engine and a whole lot more power over the LS5 454. Here’s the heart of this beast! This fire breathing 454 V8 monster could put out 450 horsepower and 500 foot pounds of torque back in the day. That means it could run with the mighty Hemi and was known to lay down low-13 second quarter miles! The chart above shows how the muscle car market has fluctuated over the past decade. 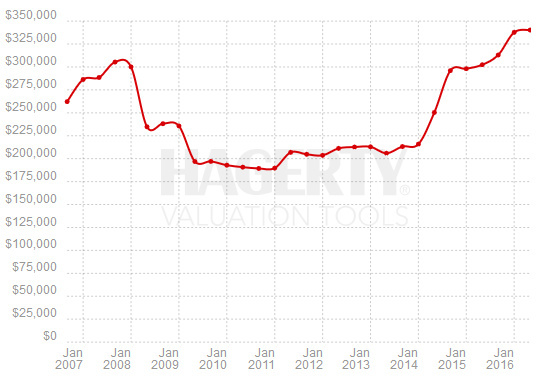 At least according to Hagerty’s index. You can see where the bubble broke, but it looks like we may have already surpassed pre-2008 prices. 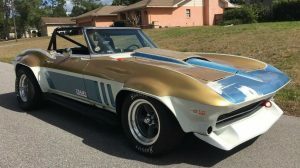 Have things topped out or are muscle cars going to continue to follow the upward trend enjoyed by other collector cars? 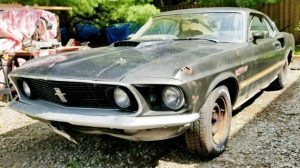 This one probably won’t be making any passes at the local drag strip anytime soon, but this thing is an amazing example of what muscle cars once were. That door edge trim has gotta go, but other than that, it’s absolutely perfect. We will be watching this one to see where the muscle car and survivor markets are headed. My guess – straight on up! That’s not the haggerty index, it’s the fool with too much money gauge, pretty amazing car. I would buy it, take it home and park it in my underground climate controlled garage, visit it during the night the first few months, feeling that satisfaction inside, then the visits will be less often over the next few years and then I’ll regrettably put it up for sale after realizing I can’t fart it in. What an amazing car!!! One of my favorites. I’m guessing it will sell for 275K. I wish I could afford it. 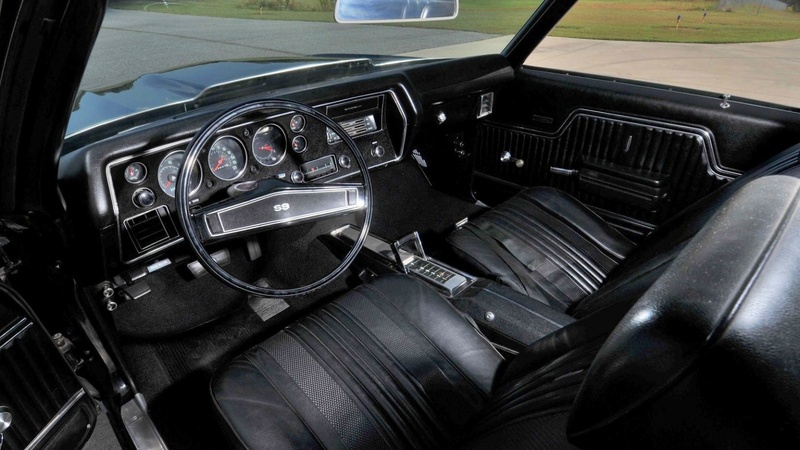 I was the first owner of a very similar ’70 Chevelle SS454 (360 hp) with the automatic transmission. I never regretted that I had an automatic. Mine had the cowl induction hood. With only 360 hp, it would fishtail in 2nd gear, and bark the tires when shifting into 3rd. I can’t imagine what it would do with 100 more hp. Mine was white with black vinyl top and stripes, with red interior. It looked fast just sitting still. Being the last year of the high compression engines, gas mileage was around 10 mpg, about 7 if you kicked in the 4-barrel carb. Would do 120 mph and still have pedal left. Boy, do I miss that car. My 2008 ‘vette is great, but isn’t my Chevelle. I hope whoever has it is taking great care of it, if it still exists. To Frankie, I farted several times in mine. With the vinyl seats, no harm done. I had an LS-5 from 1984 until 2012 that fit that description. It was automatic, white, black vinyl top, red interior. It was bought new in Nashville, TN. Probably not yours, or was it? A buddy of mine had one of these in high school. Different color, same setup. This was in ’76. In six short years these had depreciated to high school fodder. Almost all of us had these type of cars. Gas was getting expensive and these things were not well cared for. Story could be true. Just remember back then the only car of this type that was not beaten to death was a super bee. That was owned by an adult. Another “friend” story. Guy across the street got one. He was in high school – I was in 7th or 8th grade. He took me to school most mornings. Green vinyl top and interior, light metallic green paint. No stripe. Nice car. He wanted to paint it Chevelle Red. I reminded him the car had a green top and interior, so he nixed that plan. At any rate, he would party before school and late into the night. Many a morning, he would leave early, then come back to take me to school (nice guy), but I’d getinto a car smelling of weed or he’d be drinking beer at 8 am (ugh). One morning I looked out the window and whole passenger side was caved in. OMG Car disappeared shortly after. What a shame. Neat car, and I LOVE Mecum’s auctions . 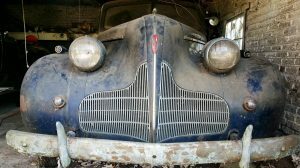 . . .BUT . . .if I have to go to a Mecum auction to get it, it just isn’t a barn find anymore . . . . It will fetch 200 k plus IMO. Looks nice. do we have documentation….we need documentation !……? Wow! What a flashback seeing the picture of this car caused. It was 1979-80 and I had just pulled up to a house in Olean, NY following a short ad in Hemmings in my own 1970 Malibu. (Red, black vinyl top and interior) There in the garage was a similar-looking, triple black 1970 LS6 with similar mileage and a $3,200.00 price tag! It too had an automatic but with a column mounted shifter. 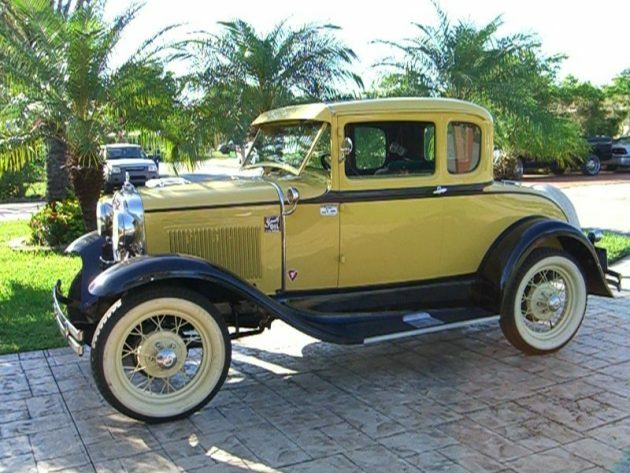 It was originally gold and the owner had had it dealer painted within a month of buying it. You had to look real hard to find the original color. He was the original owner too, btw. Oh, the sound of those solid lifters punctuating the rumble of that 454 has never left my memory. I didn’t even care that I’d probably have to be taking those big chrome valve covers off regularly to re-gap them. It was mechanical nirvana! I was ‘allowed’ to take it for a test drive and was initially scared to put the pedal down. At the urging of the owner, I finally did it and YEHAWWW!! Downshift (from 3rd to 1st) and GO! Cowl Induction opens up with that unmistakable WOT sound and the rear end blows off the tires like we were on ice! It took me about a second for my brain to register that this beast I was “controlling” (haha) was beyond my current level of driving proficiency and I side-stepped the gas pedal. I knew at that moment, I HAD TO HAVE IT!!! Fortunately (I guess) the bank wouldn’t loan me the money as a fresh out of college punk for a 10 year old car and dad wouldn’t co-sign so I had to let it go. I was able to acquire a 70 SS396 a few months later however, and it had a 4-speed! With it’s hydraulic lifters and 3:31 gear set it was a much more street-able car anyway and I loved every minute of owning it. Where are you 1363701547597 !?!?! 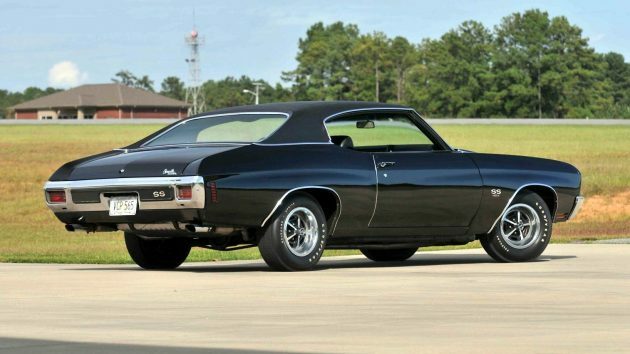 I had great fun quoting the ever-rising prices of LS6 Chevelles to dad who would just roll his eyes. He thought my SS drove like a truck! With no power steering under that big block, it kinda did…not to mention I found out he didn’t realize it was a 4-speed and was starting out in 2nd. LOL! (love you dad!) No one then foresaw the meteoric rise in values that came a decade later or ever thought of a car as an investment! Where will it end?